Centre for Career Aptitude Training, popularly known as C-CAT, has been serving the need of training for higher studies and prospective Career. Having started by an IIM Ahmedabad alumnus in the year 1996, C-CAT has trained over 20,000 students and over 2000 corporate Employees in the past 2 decates. 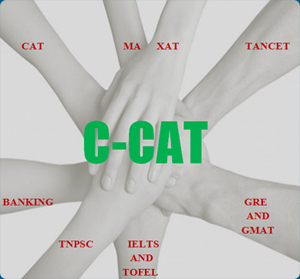 C-CAT runs preparatory courses for CAT, XAT, MAT, TANCET for admission in MBA and MCA courses in Institutes of National repute such as IIMs, XLRI, NITs etc. The Higher study abroad is promoted through student counseling and coaching classes for GRE, GMAT, TOEFL and IELTS. A Career Division of C-CAT offers classroom training program on Banking, UPSC, TNPSC, UGC NET, TN NET and Spoken English. Career Division also conducts workshop sessions on Spoken English for segmented groups like nurses, house wives and Corporate Executives. 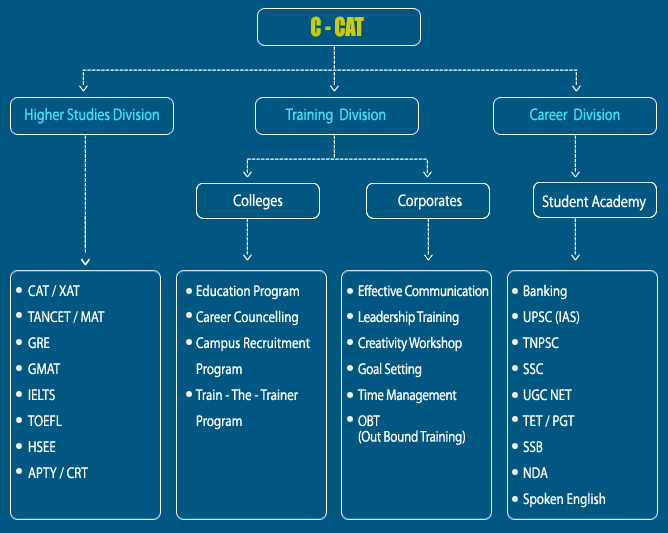 Training Division of C-CAT is divided into two broad divisions based on market segment. Service to colleges and Universities include Career Counseling, Campus Recruitment Program (CRT) to student and train – the – trainer program to faculty members. 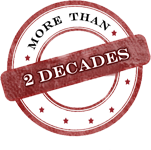 CRT has covered over 20000 students in the past 18 years covering reputed Universities like Sathyabhama, SRM, VIT and College like St. Joseph, RMK & RMD, Vellammal Engineering, SRM Eswari and others. The Corporate Training Division offers Programs on Creativity Management, Leadership and Team Building, Stress Management, Time Management and Effective Communication in Behavioural areas and Marketing and Finance Management in Functional areas: A few Corporates where such programs are given are Polaris, Ashok Leyland, Infosys, InfoTech, Aircel Cellular, both in Chennai and Bangalore.